The Go GC probably accounts for much of the difference here. The Go garbage collector, by the language designers own admission, needs some improvements. You should easily see 20k+ requests/sec on a quad core cpu with the garbage collector turned off. While running the test with the GC off is not really valid, it does give a clear indication where there is *lots* of room for improvement and does give a hint of what the language ought to be capable off given time to mature. I guess you’ll need somewhere between 1-2Gb of system RAM with the GC turned off. I hope you include node.js in the next version of this fantastically useful performance test. The Go program cannot be compiled. ‘panic’ only takes one argument now. Moreover, now ‘;’s are not necessary. Moreover, the ‘;’s at the end of each statement are not necessary now. How about chang ‘8’ to ‘7’ too? hi timyang, very good article. Could tell me which tools do You use to get the results and graphics? Great test. Interesting how well Java stands in these tests. At the level of C performance with much higher level features. What would really really make the picture perfect is adding the node.js hello world. (It’s on the front page of http://nodejs.org/). People talk very highly about it’s performance, but I don’t know how it would stack-up to these top speed platforms. It probably can’t be faster than compiled Go, and even go is relatively “bad” in this company. +1 for adding node.js to the list here. Not only G-WAN’s C scripts are much easier to write than the ‘modules’ of other servers, but they execute much faster. Would like to see node.js included! I saw a test of node.js vs Erlang somewhere else, and in that test node.js had memory leak issues. 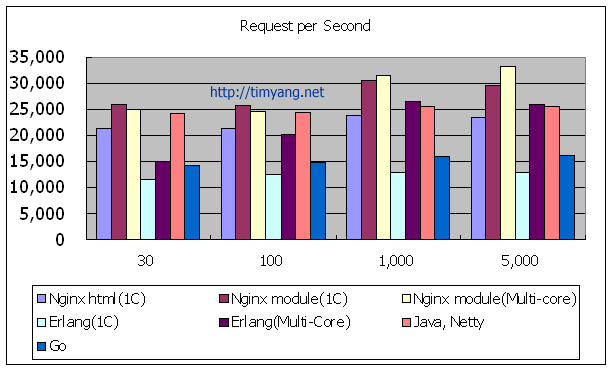 For me there’s no question, Erlang is better and more reliable then node.js for high load services. Go-lang must stay on improvement way. Tim: I’d love to see run-time memory usage added to the results of the test. Node.js = cancer. If you use that piece of crap for any sizable project you have much bigger problems than performance. Web Containers are few . Interesting comparison. Can you rerun it now that Go get a new GC? Very interested in seeing updated Go performance! I use node.js in a project with 15k lines of code. It’s mature (even though it still didn’t reach v1) and definitely fast. I think it’s one of the best things happened to web development. On va dire que cе n’est pas inexact ! The text in your article sem to be running off the screen in Firefox. Самое страшное, что официальные положения по ДМО находились в открытом доступе, просто находили на эту информацию только случайные люди. may anyone get that tyle of info in such a perfect method of writing? Thanks for youyr marvelous posting! I certainly enjoyed reading it, you happen to be a great author.